For many Filipinos, the lure of working overseas is plain and simple: money. A higher take home pay enables them to provide their family with a better life. Earning in terms of a stronger currency allows the overseas Filipino to buy more pesos. In 2015, the number of overseas Filipino workers (OFWs) was estimated at 2.4 million. Remittances reached $22 billion as of end-November 2015. But not all is well in the land of OFWs, wherever it may be. A 2011 study by Social Enterprise Development Partnerships Inc. sounded the alarm bell. One out of 10 OFWs is financially broke. Eight out of 10 of those who return to the Philippines have no savings. Despite a higher earning power compared to working the same job in the Philippines, why are they coming bank without any savings or investment? The primary reason Filipinos aim to work abroad is the higher pay which enables them to provide a better life for their families, whether in the Philippines or abroad. For OFWs working in developed countries such as the USA, the UAE, and Singapore to name a few, they are earning in stronger currencies which allow them to buy (and save) more pesos. Obviously, it’s not how much you earn, it’s how much you save. Financial planning is not only about increasing your income. Here is a guide to financial planning for those who live and work abroad. OFWs are sometimes tagged as modern-day heroes. They sacrifice the time with their family for a better life. Behind the pictures and the social media posts lies the truth –being an OFW isn’t easy. OFWs move their lives to settle into a country they know little about and immerse themselves in a whole new culture, language, traditions, and people. Such challenges may be rewarded with a better income. Obviously, best thing to do is to maximize your earning capacity. 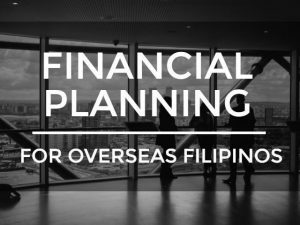 Saving and investing are keys to when the time comes, you can go back home to the Philippines with wealth both in terms of finances and experience.